1. 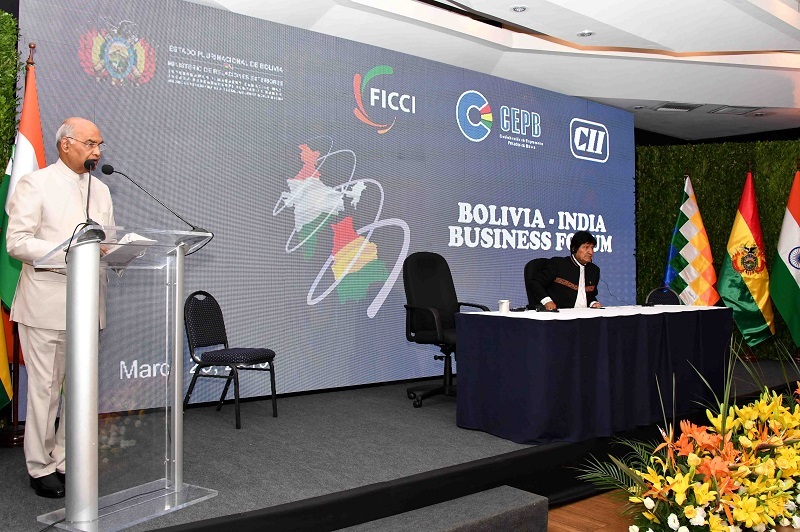 I am delighted to address the India-Bolivia Business Forum. I thank President Morales for his esteemed presence here. Our joint participation speaks of our deep mutual commitment to strengthening business ties. I thank the Bolivian Chamber and Industry groups and the Federation of Indian Chamber of Commerce and Industry and the Confederation of Indian Industry for partnering in this event. 2. I am, indeed honoured to pay the first ever State Visit from India to Bolivia. Today, I was conferred the highest award of Bolivia. This was an honour bestowed upon my country and my people, and I thank President Morales from the bottom of our hearts for this very special gesture. The task ahead for us is clearly cut out. Our political ties are strong and growing, but we have to work a lot more, hand-in-hand to bring our economic partnership to the level of our mutual understanding. I am accompanied by 30 Indian companies representing different sectors - from gold, mining, infrastructure, IT, automobile to energy. We want their ideas and enterprise to connect with Bolivian Commerce and Industry, to create new corridors of growth and prosperity. 3. During my discussion with President Morales earlier today, we committed ourselves to take our economic ties to the next level. We signed several MOUs in diverse fields. Both our countries have their own economic strengths, and the two can complement each other in the mutual quest for growth and prosperity. India is today the 6th largest economy in the world. We manufacture everything from satellites, light aircraft, cars to major high technology industrial products. We have the third largest scientific human resource pool in the world. All these aspects, coupled with our large middle-class market of over 400 million and a vibrant business ecosystem fostered under a stable democratic governance system, position India as a unique destination for international trade and business. Our sustained efforts to create a business friendly environment have led to a spectacular jump of 65 places on the World Bank Ease of Doing Business Index in the last four years. India means business and is ready for more business. 4. Indian economy has been growing over 7% for several years and the forecast for the future is equally robust. At this rate, we would become a 5 trillion dollar economy by 2025. This holds immense potential for our global stakeholders to establish energy, natural resource, infrastructure and technology collaboration with us. Bolivia, with its huge natural resource base, can become a valuable partner for us, creating new jobs and prosperity for both countries.Yes, it is true that distance is a factor in trade and investment collaboration. But with seamless connectivity made possible by digital communications and globalization, I must say, we have overcome this limitation in a major way. 5. On the trade side, we are doing well but we can do a lot more. Two-way trade has picked up in the last two years. Our total bilateral trade grew by over 200 per cent in 2018 touching 875 million US dollars. With this India became the third largest export destination for Bolivia. We import almost 60% of Bolivian gold. This is impressive no doubt, but we need to broaden the trade basket. I am confident that with efforts of all our stakeholders, Confederation of Private Entrepreneurs of Bolivia, CAINCO, CABINCO and others from Bolivia and FICCI and CII from India, new ideas can take roots and flourish as promising businesses. 6. In India, we have a focused business approach to this region. We hold the India-Latin America and Caribbean Conclaves annually to deepen our business collaborations. These Conclaves have served us well. Several Indian global majors have made entry into Bolivia through them, bringing cutting-edge technology, products and services to the people. Our automobile products are performing well on the Bolivian roads. India today is the largest drug manufacturer in the world. Our high quality and cost-effective medicines and medical devices are enabling countries and governments to not just provide quality healthcare but also to lower their costs. 7. Indian IT capacity is another critical area for Bolivia to leverage. Our IT services are helping countries to make public service delivery efficient, targeted and cheaper. Given our mutual commitment to social equity and improving the lives of the poor, India has much to share from its DIGITAL INDIA and SKILL INDIA programmes with Bolivia under the framework of South-South Cooperation. 8. We are committed to a transformational economic growth in India. But we want to be respectful of Mother Earth, of nature, in the same manner and with same devotion as you have done. We want our progress to be propelled by clean technology and sustainable practices. We want growth and environment protection to go hand in hand. We have established the International Solar Alliance to develop clean pathways and to tackle climate change. We welcome Bolivia in the Alliance and look forward to creating a greener planet with its support and ideas. As part of this commitment, we have a target to produce 175 gigawatts of renewable energy by 2022, including 100 gigawatts of solar energy. We are developing our capacity and at the same time making available our services to fellow countries to tap renewable energy. We see opportunities for tie-ups with Bolivia in solar, wind and bio-fuel segments. 9. Talking of environment and sustainability, we have an ambitious programme to develop electric vehicles in India. And for this, we want to enter into long-term Lithium partnership with Bolivia. Indian enterprises are keen to mark their presence here as investment and technology partners - to develop lithium products and to master storage technology. We look forward to such promising ventures taking wings. India has gained vast expertise in developing modern infrastructure-, from railways, highways, waterways, airways to energy pathways. This can also be a potential area for collaboration between our two countries. 10. Agriculture is another area that holds promise. Indian agro-scientists have won international patents for developing critical agricultural techniques and high-yielding variety of seeds. Our companies are keen to invest in the agriculture sector in Bolivia and enhance food security for our two peoples. 11. India has made impressive advances in the domain of Space applications. We sent a vehicle to the Moon in the very first attempt at an unbelievable cost of only 60 million US Dollars, less than what it takes to make a Hollywood science fiction! We successfully launched 104 satellites into the orbit from a single launch vehicle, the first of its kind in the world. We now look forward to our first human space flight mission in 2022. Bolivia, I understand, has plans to develop its space satellite programme. We can be a reliable partner for each other in this sector. 12. In keeping with our commitment to deepen our economic connect with the world at large, we have extended e-visa facilities covering business visits to all Latin American and Caribbean countries. We would be happy if our business community were encouraged with easier travel to Bolivia and a more predictable business environment in the country, for them to plan and prospect better, and for us to deepen and strengthen our partnership. 13. With those words, I once again thank President Morales for his esteemed presence and deep commitment to foster India-Bolivia economic relations. And I wish each one of you success in your business endeavours.